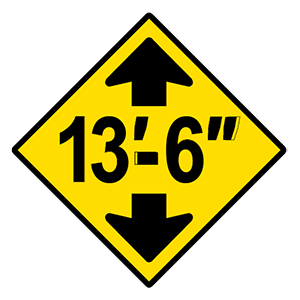 Warning signs are usually diamond-shaped with black markings on a yellow background. They alert drivers to upcoming hazards. 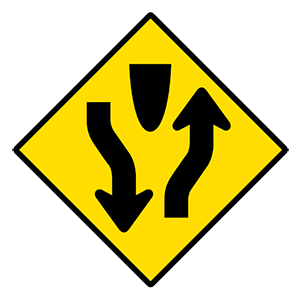 This warning sign indicates that drivers are about to encounter a divided highway. You may not park within ____ of a fire hydrant. Drivers should not park within 10 feet of a fire hydrant. Drivers should only park where it is legal to do so and where other drivers can clearly see their stopped vehicle. 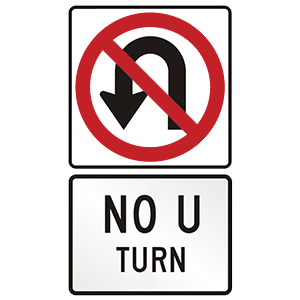 You should signal to turn ____ before beginning your turn. When you wish to change lanes or make a turn, signal to inform other motorists of your intention. 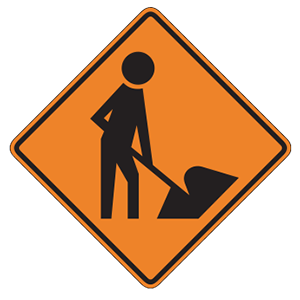 Signals should be activated at least 100 feet before you make the turn. Continue signaling until you have completed the turn or lane change. 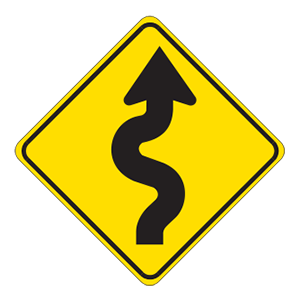 This sign indicates that a divided highway begins ahead. 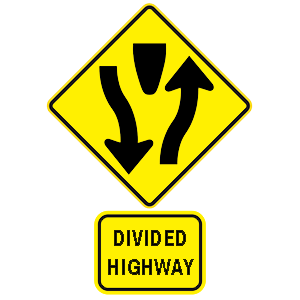 The road splits into two one-way roadways separated by a median or divider. You must keep to the right.